No, it is not a wok, and it is not an UFO out of the 50´s scifi movies...It resembles an inverted steel drum, and it sound is somehow similar yet more tribal and hypnotic, relaxing and serene. The instrument has a soft, sorrowful, melancholic tone a perfect companion for emotional and ambient music.Despite its rarity (and price) it's been embraced by many hippy communities and musicians on the street (sure a great inversion) and it's quickly become an sensation and new hottest trend among hand drum players. The drum is an idiophone instrument that was invented by Felix Rohner and Sabina Scharer of PANart in 2000 in Switzerland. It was shown in 2001 at Musikmesse Frankfurt. It was the result of the investigation the result of many years of research on the steelpan and the study of the diverse collection of instruments from around the world, such as Gongs, Gamelan, Ghatam, drums, bells, etc The inventors were inspired to make the drum instrument from ethno musicological roots. They made it keeping in mind the Hijaz, the Aeolian and the Ake Bono. It takes its name from the Swiss German Bernese dialect word for "Hand" as the instrument is indeed played with the handd typically resting on the player´s lap, though you can also use a stand. The Hang is made from two hemispheres of chemically-strengthened steel joined together by aprocess called gas nitride and those two "dishes" together render an object that looks like a flying saucer. The two sides are referred to as the Ding and Gu. The Ding side contains seven to nine "tone fields" (the notes of the hang), which look like dents in the surface, arranged in a circle around the Ding itself, a smaller hemisphere in the center. The scale of the notes are chosen by the owner when the Hang is constructed and indeed can be customized to render different scales. The Ding can also be struck to create a deeper, gong-like note. The ding of the drum instrument when played produces a sound like steelpans tune like harmonica, harps and bells. The player can change the scale he is playing in by striking the tone fields that lay in cross pattern around the center. The Gu side of the drum instrument is resembles the sound made by ghatam. The Gu side has a bass port that can be played by slapping your palm over the hole (like an Udu) or used to bend the sound when playing the ding side. 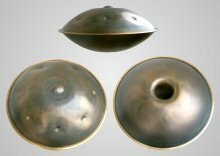 Udu like sounds can be produced with the air resonance within the clamped shallow shells, with the notes sounding like bells or harmonically tuned steel pans.The inner note on the bottom dome is the bass note, and when played in a dampened way allows change in pitch like a talking drum. Seven (in the bass version) or eight (treble version of the Hang) notes are tuned harmonically around a central deep note. The hemispheres are hardened by a process known as gas-nitriding. The Hang is sometimes referred to as a Hang drum because it is often played by, and associated with, drummers. The 'drum' label is discouraged by PANArt and many players as simple drumming can limit the sonic complexity of the Hang. In fact playing it as a drum can be aggressive on the instrument cause injury to the player and detuning of the Hang. There are many ways to produce sound out of a Hang that do not involve what many consider 'drumming'. Metallurgical and acoustic research by the makers has led to significant changes and refinement in structure, design, and process over the years since the first Hang was offered. In the spring of 2006 the hangmakers presented a new generation with an a upper surface of annealed brass and a ring of brass around the circumference. Thus we can distinguish among first (those made from 2001-2005) and second generation hangs (afterwards). The instrument is often named HANG DRUM because it is associated with drums and drummers. 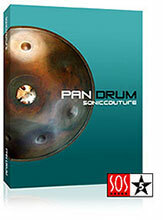 Its creators, the PANart do not like their drum instrument to be labeled as ‘drum’. This is because simple drumming reduces the sonic complexity of the hang. If the their instrument is played only like a drum then the music gets detuned and it can also cause injury to the player. How do we get a Hang Drum? I'm sorry, not EASY, neither CHEAP.The inventors are the only two people in the world who make hang drum instruments. They have their workshop in Berne where they have created each and every piece. The official site of the hang drum made by Panart is no longer working, of course they may have a long queue of orders still, but sadly the process involving one implies a long wait, quite a lot of money and a visit to the inventors. Somehow you can find second hand hang drums on ebay but the price they can reach is very high. When knowing more about the official way I shall come and edit the article, feel free to comment and provide your own input. 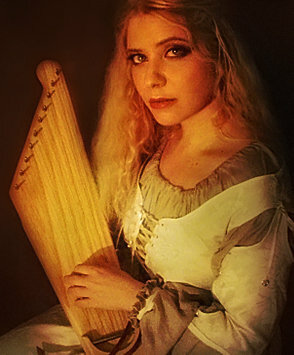 There is a very similar instrument to the hang which is the so called Caisa (in fact there´s a generation of instruments "similar to the hang" related as "handpans"). The caisa made out of steel and wood and played in a very similar way by Bill Brown in Germany. It's a bit more available and cheaper (yet not cheap (over 1000 Eur). You can find it on purchase for example in this store. Or you can try ebay for CAISA, there are often CAISAs in different tuning for less than 1000 Eur or even less if second hand.